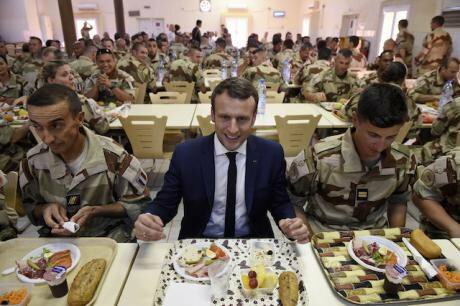 French President Emmanuel Macron lunches with French troops during his visit to France's Barkhane counter-terrorism operation in Africa's Sahel region in Gao, northern Mali, 19 May 2017, his first trip outside Europe since his inauguration on 14 May 2017. Pool/Press Association. All rights reserved.The Sahel region took centre stage last week as African leaders met at the regional Dakar International Forum on Peace and Security to discuss growing lawlessness along its arc. Consequently, Senegalese President Macky Sall on Monday called for a unified, comprehensive military response that leaves no room for Africa’s terror groups to hide. While such a response has been welcomed with open arms, concerns have been expressed over the possible sidelining of human rights. Fears abound that without adequate safeguards, any new military intervention will only worsen the bloodshed. It is not difficult to see why a military option has so much appeal as the best approach to resolve the security issues in an increasingly volatile region. Since Libya descended into civil war in 2011, Islamists have overrun parts of northern Mali to the east, and Boko Haram has been persistent in its efforts to secure a foothold at the heart of the region in northern Nigeria. To the south, militants threaten the Sahel from Congo, Central African Republic and South Sudan. At the same time, partially as a result of the militants’ advances, a humanitarian crisis is unfolding. This year, at least 11 million are facing a major food crisis. The UN has called for efforts to break the cycle of food crises, citing land degradation, population displacement, and ongoing political instability as the pillars of Sahel’s hardship. This year, at least 11 million are facing a major food crisis. The Dakar peace forum comes on the heels of the launch of the G5 Sahel force in July, a military initiative working across Burkina Faso, Chad, Mali, Mauritania and Niger to root out jihadist groups in the region. The newest joint international force in the world, the G5 Sahel envisions up to 5,000 military, police and civilian troops by March 2018. As part of a greater strategic push for intensified cooperation with the Sahel zone, the EU pledged to support the force with $50 million in funding. Brussels hopes that the migration streams from the region will be reduced when the underlying causes for regional instability are assertively tackled. Added to the 4,000 French troops already deployed across the Sahel, one could be optimistic about the force’s capacity to target and eliminate terrorist hotspots across the Sahel. However, the hopeful rhetoric of European and Sahel leaders should be matched with an equal sense of caution. While focus is placed on gathering the necessary funds and troops, the mission crucially overlooks human rights protection as an important aspect in appeasing the region. And if history is a lesson, without a robust human rights framework, international missions are more likely to add to, rather than prevent, violence. The G5 Force is unlikely to be an exception. So earlier this month, the UN Assistant Secretary-General for Human Rights Andrew Gilmour visited Mali with the express purpose of discussing a human rights compliance mechanism for the Sahel Force. He described respect for human rights as a “cornerstone” in the fight against terrorism. He is right to stress this point: sexual exploitation and abuse by peacekeepers throughout Africa has been well-documented, leading the UN Security Council to adopt a resolution targeting UN peacekeepers in March last year. The UN Security Council called on the G5 Sahel force to implement a gender perspective in fulfilling strategic operations, citing the role women play in preventing conflict and pursuing peace-building projects. Though participants of this week’s conference stressed a universal respect for human rights and international law, no specific provisions have been put in place to ensure compliance. But within a new and poorly organised international force, it is unclear how these provisions would be implemented even once articulated. Simply put, a military-focused approach will not solve broader governance issues relating to civil liberties and human rights. This is especially true when the military is part of the problem. In Mali, this is more often the case than not. Government troops have committed grievous human rights violations, with extrajudicial killings, forced disappearances, torture and arbitrary arrests reported in recent years. Earlier this year, Burkinabe soldiers allegedly burned property and beat at least 70 men accused of supporting a local Islamist group. Adequate control of G5 forces is furthermore hindered by the complexity of fractured societies as the operational environment. Earlier this year, Burkinabe soldiers allegedly burned property and beat at least 70 men accused of supporting a local Islamist group. Conflicts in the region are the result of a “sedimentation of problems”, and terrorism is only the topsoil. Issues of state legitimacy, violent offences by security forces and corruption contribute to pervasive tensions within local populations. It is unclear how the G5 hopes to address these concerns. Given how local populations are routinely victims of arbitrary arrests and other abuses of troops, the force’s ability to elicit trust from locals is severely limited. Human rights violations are frequently justified in the name of fighting terrorism, thereby undermining the legitimacy of the troops and the governments they represent. Rather than alleviating the problem, many young people reportedly join rebel groups in reaction to treatment at the hands of government forces. The risk of further violence is especially high given the involvement of partners that are likely to use Sahel Force participation to cement their power. Mauritania is a key example: President Abdel Aziz has been trying to assert his grip over the country in a controversial referendum where voting for changing Mauritania’s flag was combined with abolishing the nation’s senate. The move laid the groundwork for Abdel Aziz to unlawfully extend his stay in office indefinitely. Highly unpopular, Aziz could be tempted to employ his country’s G5 military contingent to crack down on civil unrest in the name of maintaining regional stability. The effect will be counter-productive, as this will likely fuel anti-establishment sentiment and increase the risk for religious radicalization. The European countries backing the G5 Force have a responsibility to ensure that protecting civilians comes first. France, being militarily active in the region, could no doubt help improve training and share intelligence with local troops. Failing to do so would leave the people of the Sahel vulnerable to an inadequately trained and politically disparate armed force united in name only, resulting in the exacerbation of existing problems and empowering of abusive regimes.